Lotion is a common item to find in a woman’s purse, so you might as well disguise gadgets as commonly found items. At least that seems to be the Japanese gadget makers way of thinking. After all, they love to model their gadgets after food, jewelry, compacts and many other items you’d find lying around. I suppose if anyone were quickly rummaging through your purse for something to steal they’d at least leave this one alone. 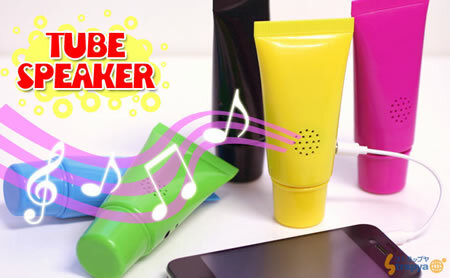 These Colurful Tube Speakers come in yellow, pink, green, blue and black. Each one will hook up to your audio devices and work as a portable speaker. I sincerely doubt it’ll have top of the line sound, but it will be highly portable and inconspicuous. Each one of these sells for 1,980 JPY or about $23.20 through Strapya World.